Nuclear fusion is the process by which two light atomic nuclei combine to form one heavier atomic nucleus. As an example, a proton and a neutron can be made to combine with each other to form a single particle called a deuteron. In general, the mass of the heavier product nucleus (the deuteron, for example) is less than the total mass of the two lighter nuclei (the proton and the neutron). The mass that "disappears" during fusion is actually converted into energy. The amount of energy (E) produced in such a reaction can be calculated using Einstein's formula for the equivalence of mass and energy: E = mc 2 . This formula says even when the amount of mass (m) that disappears is very small, the amount of energy produced is very large. The reason is that the value of c 2 (the speed of light squared) is very large, approximately 900,000,000,000,000,000,000 meters per second. Cold fusion: A form of fusion that some researchers believe can occur at or near room temperatures as the result of the combination of deuterons during the electrolysis of water. Deuteron: The nucleus of the deuterium atom, consisting of one proton combined with one neutron. Neutron: A subatomic particle with a mass of about one atomic mass unit and no electrical charge. Nuclear fission: A nuclear reaction in which one large atomic nucleus breaks apart into at least two smaller particles. Nucleus: The core of an atom consisting of one or more protons and, usually, one or more neutrons. Plasma: A form of matter that consists of positively charged particles and electrons completely independent of each other. Proton: A subatomic particle with a mass of about one atomic mass unit and a single positive charge. Thermonuclear reaction: A nuclear reaction that takes place only at very high temperatures, usually on the order of a few million degrees. Over the past half century, a number of theories have been suggested as to how such fusion reactions might occur. One problem that must be resolved in such theories is the problem of electrostatic repulsion. Electrostatic repulsion is the force that tends to drive two particles with the same electric charge away from each other. But forcing two like-charged particles together requires a lot of energy. Where do stars get that energy? The answer to that question has many parts, but one part involves heat. If you raise the temperature of hydrogen gas, hydrogen atoms move faster and faster. They collide with each other with more and more energy. Eventually, they may collide in such a way that two protons will combine with (fuse with) each other. Reactions that require huge amounts of energy in order to occur are called thermonuclear reactions: thermo- means "heat" and -nuclear refers to the nuclei involved in such reactions. The amount of heat needed to cause such reactions is truly astounding. It may require temperatures from a few millions to a few hundred millions of degrees Celsius. Such temperatures are usually unknown on Earth, although they are not uncommon at the center of stars. Scientists now believe that fusion reactions are the means by which stars generate their energy. In these reactions, hydrogen is first converted to helium, with the release of large amounts of energy. At some point, no more hydrogen is available for fusion reactions, a star collapses, it heats up, and new fusion reactions begin. In the next stage of fusion reactions, helium nuclei may combine to form carbon nuclei. This stage of reactions requires higher temperatures but releases more energy. When no more helium remains for fusion reactions, yet another sequence of reactions begin. This time, carbon nuclei might be fused in the production of oxygen or neon nuclei. Again, more energy is required for such reactions, and more energy is released. The end result of this sequence of fusion reactions is that stars heat up to temperatures they can no longer withstand. They explode as novas or supernovas, releasing to the universe the elements they have been creating in their cores. Dreams of harnessing fusion power for human use developed alongside similar dreams for harnessing fission power. The first step in the realization of those dreams—creating a fusion bomb—was relatively simple, requiring a large batch of hydrogen (like the hydrogen in a star) and a source of heat that would raise the temperature of the hydrogen to a few million degrees Celsius. Encapsulating the hydrogen was the easy part. A large container (the bomb casing) was built and filled with as much hydrogen as possible, probably in the form of liquid hydrogen. Obtaining the high temperature was more difficult. In general, there is no way to produce a temperature of 10,000,000°C on Earth. The only practical way to do so is to set off a fission (atomic) bomb. For a few moments after a fission bomb explodes, it produces temperatures in this range. All that was needed to make a fusion bomb, then, was to pack a fission bomb at the center of the hydrogen-filled casing of the fusion bomb. When the fission bomb exploded, a temperature of a few million degrees Celsius would be produced, and fusion would begin within the hydrogen. As fusion proceeded, even greater amounts of energy would be produced, resulting in a bomb that was many times more powerful than the fission bomb itself. For comparison, the fission bomb dropped on Hiroshima, Japan, in August of 1945 was given a power rating of about 20 kilotons. The measure 20 kilotons means that the bomb released as much energy as 20,000 tons of TNT, one of the most powerful chemical explosives known. In contrast, the first fusion (hydrogen) bomb tested had a power rating of 5 megatons, that is, the equivalent of 5 million tons of TNT. As with nuclear fission, scientists were also very much committed to finding peaceful uses of nuclear fusion. The problems to be solved in controlling nuclear fusion reactions have, however, been enormous. The most obvious challenge is simply to find a way to "hold" the nuclear fusion reaction in place as it occurs. One cannot build a machine made out of metal, plastic, glass, or any other common kind of material. At the temperatures at which fusion occurs, any one of these materials would vaporize instantly. So how can the nuclear fusion reaction be contained? One of the methods that has been tried is called magnetic confinement. To understand this technique, imagine that a mixture of hydrogen isotopes has been heated to a very high temperature. At a sufficiently high temperature, the nature of the mixture begins to change. Atoms totally lose their electrons, and the mixture consists of a swirling mass of positively charged nuclei and negatively charged electrons. Such a mixture is known as a plasma. One way to control that plasma is with a magnetic field, which can be designed so that the swirling hot mass of plasma within the field is held in any kind of shape. The best known example of this approach is a doughnut-shaped Russian machine known as a tokamak. In the tokamak , two powerful electromagnets create fields that are so strong they can hold a hot plasma in place as readily as a person can hold an orange in his or her hand. The technique, then, is to heat the hydrogen isotopes to higher and higher temperatures while containing them within a confined space by means of the magnetic fields. At some critical temperatures, nuclear fusion will begin to occur. At that point, the tokamak is producing energy by means of fusion while the fuel is being held in suspension by the magnetic field. Research on controlled fusion power has now been going on for a half century with somewhat disappointing results. Some experts argue that no method will ever be found for making fusion power by a method that humans can afford. The amount of energy produced by fusion, they say, will always be less than the amount of energy put into the process in the first place. Other scientists disagree. They believe that success may be soon in coming, and it is just a matter of finding solutions to the many technical problems surrounding the production of fusion power. 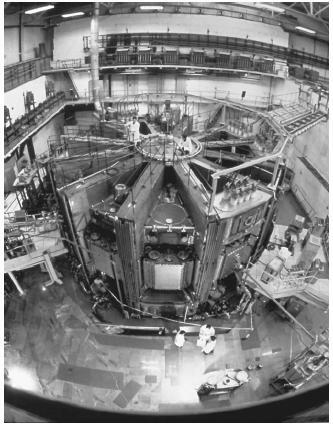 The scientific world was astonished in March of 1989 when two electrochemists, Stanley Pons and Martin Fleischmann, reported that they had obtained evidence of the occurrence of nuclear fusion at room temperatures. Pons and Fleischmann passed an electric current through a form of water known as heavy water, or deuterium oxide. In the process, they reported fusion of deuterons had occurred. A deuteron is a particle consisting of a proton combined with a neutron. If such an observation could have been confirmed by other scientists, it would have been truly revolutionary: it would have meant that energy could be obtained from fusion reactions at moderate temperatures rather than at temperatures of millions of degrees. The Pons-Fleischmann discovery was the subject of immediate and intense study by other scientists around the world. It soon became apparent, however, that evidence for cold fusion could not be obtained by other researchers with any degree of consistency. A number of alternative explanations were developed by scientists for the fusion results that Pons and Fleischmann believed they had obtained. Today, some scientists are still convinced that Pons and Fleischmann made a real and important breakthrough in the area of fusion research. Most researchers, however, attribute the results they reported to other events that occurred during the electrolysis of the heavy water. I realy appreciate this article.Its Fantastic.It gives me a lot of information and i have really have a clen and detailed study.Thanks for your hardwork and cooperation. is it possible to create a reoccuring fusion reaction without needing to add a continual stream of hydrogen atoms. i do understand that this is the source to a large ammount of energy also that hydrogen is the most common element on earth but is it possibe to create another sun basically?